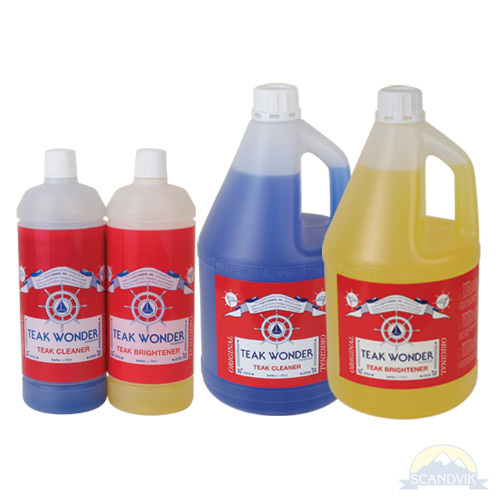 Combo Pack contains 1 bottle of TEAK WONDER® CLEANER and 1 bottle of TEAK WONDER® BRIGHTENER. TEAK WONDER® Combo Pack is a complete kit for cleaning small areas. The kit contains one bottle of cleaner and one bottle of brightener to perform the complete cleaning cycle. The one liter bottles are equipped with a handy cap/pourer that allows easy use of the products, avoiding waste. For the application process, see the instructions for TEAK WONDER® CLEANER and TEAK WONDER® BRIGHTENER.